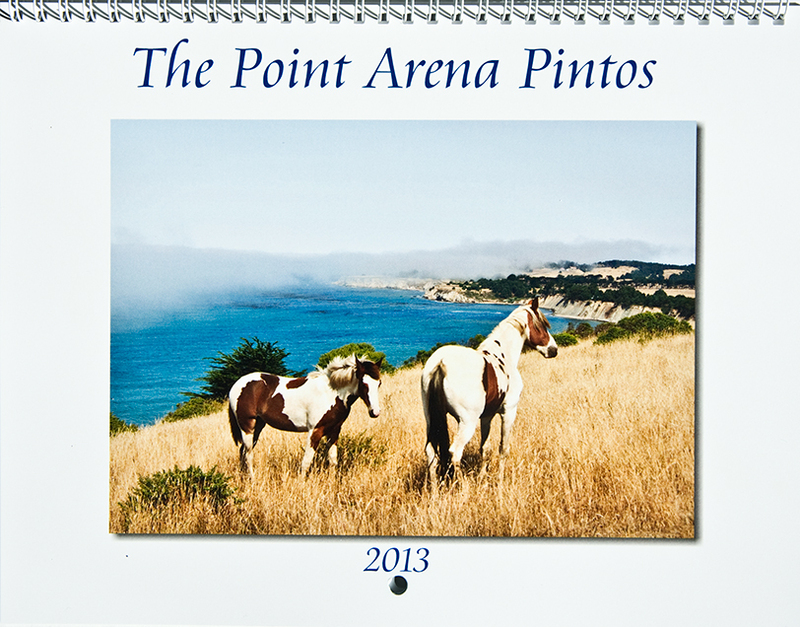 The Pintos are very happy to announce that there new calendar is out and for sale! They love being photographed and having people see their photos. 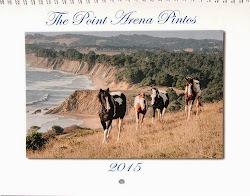 The calendar is one way to see these horses in their natural environment. 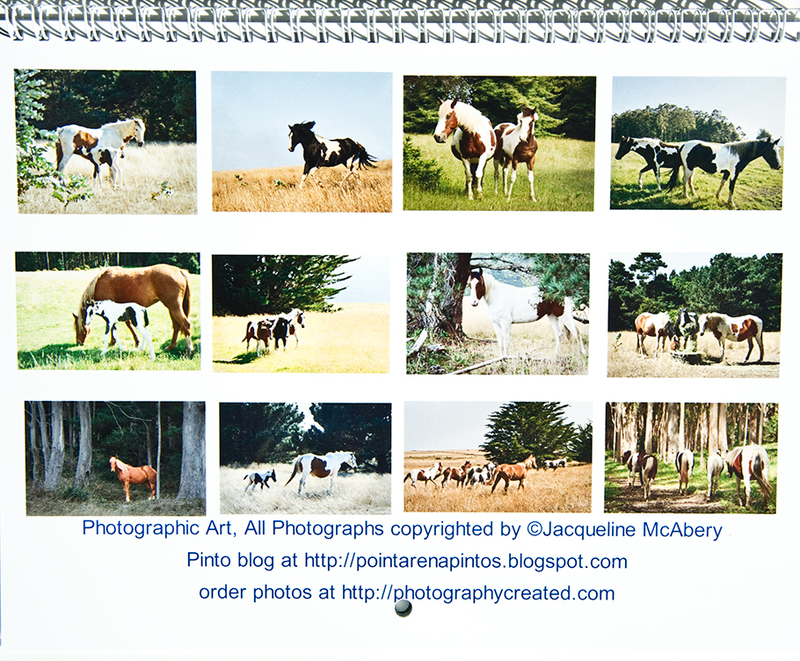 Also the calendars make great Christmas presents and a wonderful way to start out the New Year! Chie and Sweetie are on the front cover - they are both delighted to be singled out for the cover! Please email me at pa@photographycreated.com, if you wish to purchase the calendar. The price is $22.00 which includes packaging and shipping. You can pay me through paypal. All proceeds go to the care of the pintos. 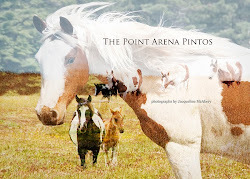 Kathe Smothers is our wonderful trainer for the Point Arena Pintos as well as a dear friend. I highly recommend her if you are looking for an excellent trainer who has a gentle approach to horses. She lives in Southern California but does clinics all over the state and also gives private lessons. 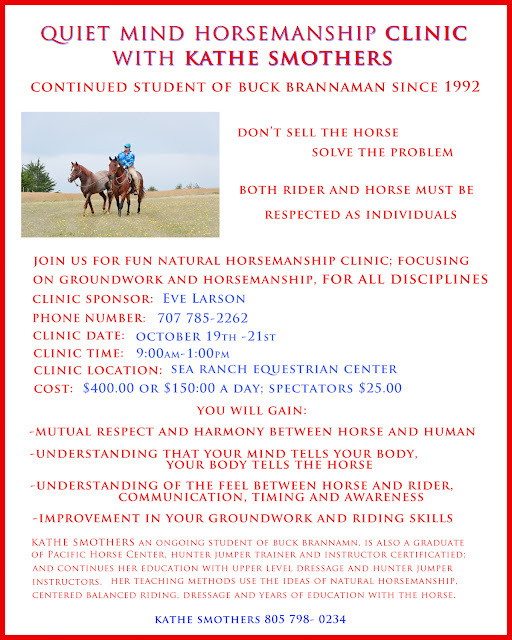 She is doing a clinic this week-end at the Sea Ranch Equestrian Center. Give Eve a call about this clinic at 707 785-2262 or Kathe at 805 798-0234. 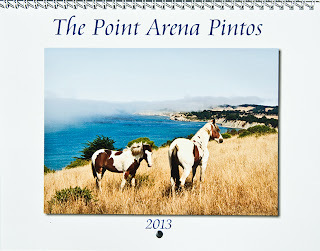 I have been wanting to shoot videos of the pintos for some time. Photography is my thing, not movies but I am experimenting with a video camera. I have not set up editing software on my computer yet, so here are four short clips. There is not a lot of action - just walking horses. Hopefully, as I learn more, the videos will improve! Some of the herd walking through Eucalyptus trees. The morning after returning from the Buck clinic (May 2 nd), I went out to feed the pintos and I noticed a strange little horse. I wondered where it came from because it was not there the night before. I then realized that beautiful Moonbeam had her baby, much to my surprise, as I wasn't expecting the foal until June or August. Moonbeam turned two May 6th, since horses gestate for eleven months she was just a year + when she conceived. 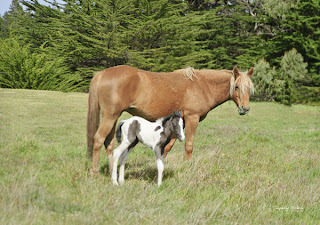 Before we knew she was already pregnant, we had all the stallions she lives with gelded. Suki is the dad and he had a good time just before he was fixed! Although, a young mare she is a very good mother and we have increased her feed so she has plenty of milk. 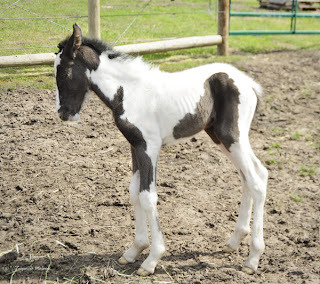 Her filly's name is Ceilo Luna which means Heaven/sky moon. She is just a few hours old in these photos and is my grandson's horse - he chose her name and is very excited and can't wait to meet her! She is already nibbling on alfalfa hay; runs, hops, bucks and is a pure delight to watch! As I have mentioned in earlier posts, we want to be able to halter as many horses from the herd as possible so that they can get their hoofs trimmed and they can be treated by a vet if needed. 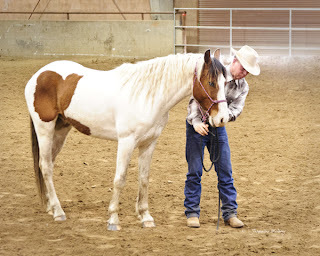 Little One was having a hard time accepting love and training for the halter so we decided that it might be helpful to take him to a Buck Brannaman clinic. You may have seen the documentary" Buck" that came out last year. (You can read more about him and get the DVD at http://brannaman.com/) Buck has started horses since he was a child and his approach is gentle and kind. 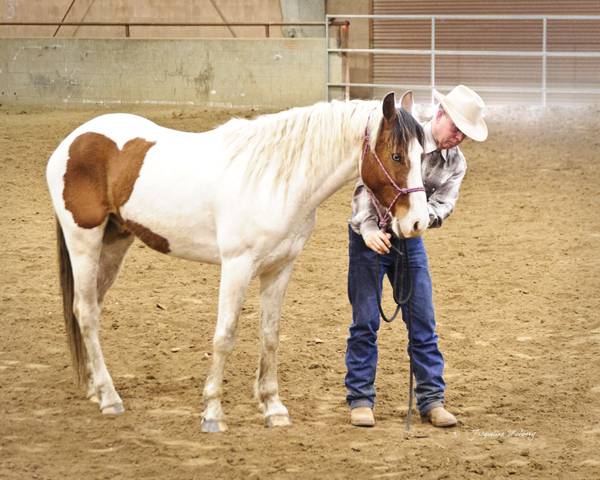 He spends nine months of the year traveling around the country teaching four day clinics. 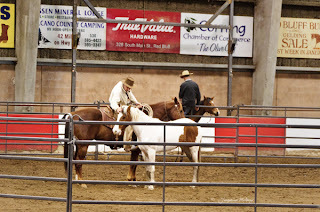 We are very fortunate that Little One was able to attend his colt starting clinic at Red Bluff fairgrounds April 27th-30th. 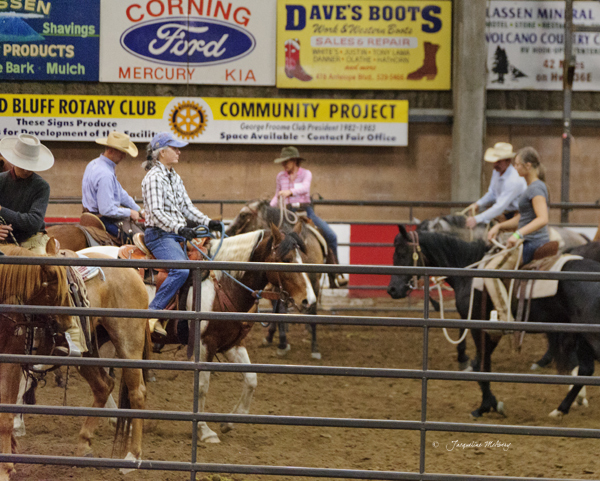 It was a wonderful experience - friends and family traveled to Red Bluff to learn from Buck and they also got the added treat of watching Little One. 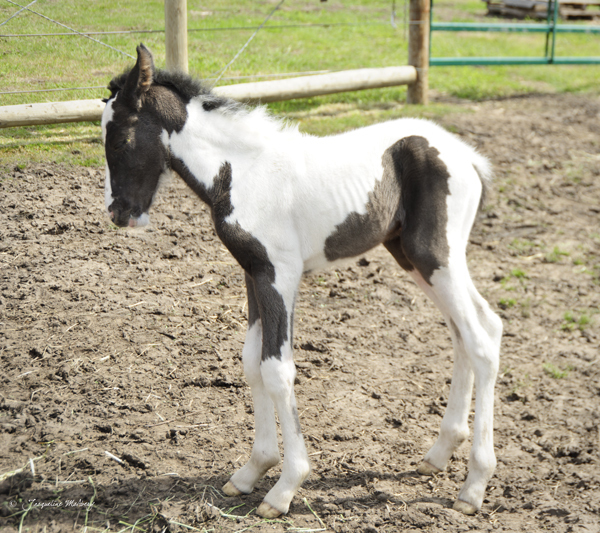 We loaded Little One in the trailer early in the morning and eight long hours later we arrived. He was fortunate to be able to stay in an outside pen. 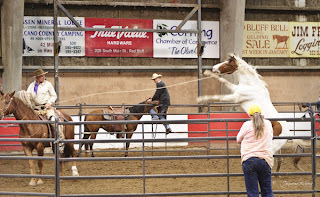 Kathe Smothers, our wonderful friend and trainer, had told Buck ahead of time that he would need to rope Little One in order to get him started. We weren't sure beyond that what would happen. 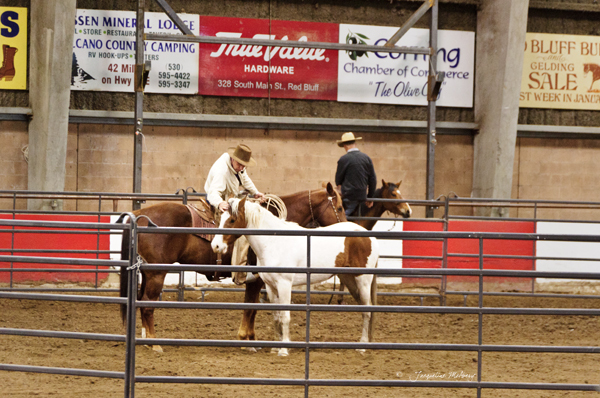 There were twelve horses with owners in the indoor arena. We were told to trailer Little One into the arena and put him in the round pen in the center. After talking to the class for about an hour and giving the participants techniques to practice, Buck worked with Little One each morning in the pen for about an hour the first two mornings and a half hour the third morning. By the second morning, Little One was haltered and calm enough on the third afternoon for us to do ground work with him in the outside pen. Success! Little One was the star as he was the only horse that needed to be readied for a halter and he basically had private sessions with Buck. He is one very lucky horse! A horse needs to be roped and worked with before a halter can be put on them. Here is Little One resisting. Buck is on his horse and Kathe is watching outside the pen. 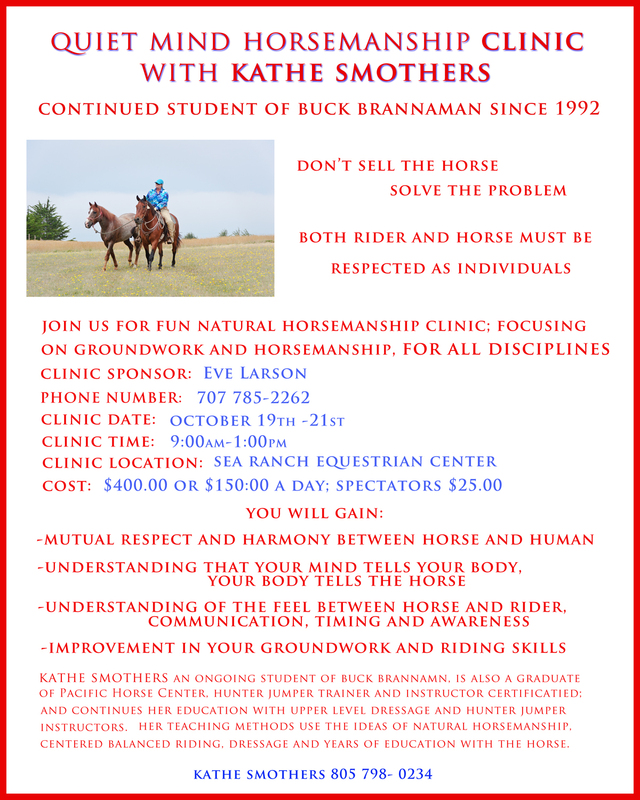 Kathe has studied and ridden with Buck for twenty years -we and the herd are very lucky to have her as our trainer! 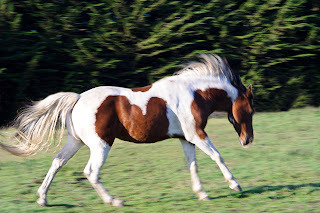 You can learn more about her work at http://quietmindhorsemanship.com/ Kathe will be teaching a clinic at Sea Ranch stables in June. I will post more information about this once the date is settled. Finally Little One gets touched!!! We have waited a long time to be able to touch this shy sweet horse. Kevin a friend and student of Kathe's is doing ground work with Little One in the arena on the third day. 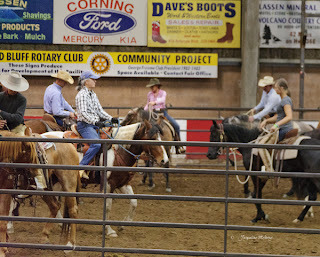 Here is a photo of Eve (in the blue cap) riding Buster in the clinic. She was smiling a lot and it was a delight to watch her with her lovely pinto! This was quite an adventure for all of us and one we won't soon forget!